Piedmont to put even more on the map. Karina lived six years in the heart of Piedmont (3 years Barbaresco/3 years Cherasco) and was daily with wine lovers in the cantinas, very intensively listening to the story of the wineboer. Various workshops and training courses such as AIS SOMMELIER PIEMONTE also provided additional in-depth knowledge. Made In Piedmont Wines therefore has a clear mission, consciously opts for one region of the country of the boot. offers a balance between top brands (including Gaja, Mascarello, Voerzio, Conterno) and lesser-known wineries. Made In Piedmont Wines advises you, so that you always have the triangle of your audience & taste, your budget and your occasion perfectly balanced. Orders for wines of NOT exclusive domains are always with a minimum of 6 bottles where this minimum does not apply to the exclusive domains, and must always be accompanied by an additional order of value 100 € of the wines of our exclusive domains, see condition 3. Do you want to give somebody a voucher? Send an email to sales@madeinpiedmont-wines.be and we'll inform you on how you can do this. Do you only want to learn about the big names from Piedmont, but are tou open for new propositions? Subscribe for our tastings. You want to come to our tastings but your available dates don't match with our presence in your region? 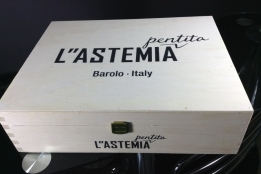 Check underneath the caption Winetasting - Poesia della Terra Private.? This might be what you are looking for.